It’s funny how things happen. One day you’re squatting next to your wife in a cramped laundry room doting over a neurotic Alaskan Husky who is in the process of squirting out wriggly little husky mutt puppies and the next day, it’s over 12 years later and you’ve just gotten off the phone with the vet, setting up the date and time of one puppy’s death. is what they say. To me she’s still that same wriggly little puppy, solid black with the white tip on her tail differentiating her from several other squirming black balls of fur. Of course, she’s not solid black these days. 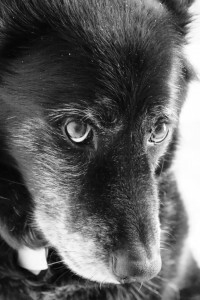 Her muzzle long since turned grey with the white of age creeping in around her eyes. Her chest covered in long wisps of silken white and even her tail trailing bits as well, though her signature white tip, once disappeared, has come back to mark her as that one pup I favored more than the others in that litter. The one that I had the hardest time parting with when we initially found them homes. 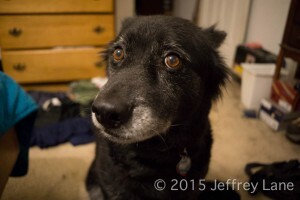 She’s been the most gentle, sweetest dog I’ve known. Hard headed, for sure, but smart and alert. She’s been our protector, our cuddler and a big, soft, fuzzy presence her entire life, save the few months early on when we thought we had found a Forever Home for her. 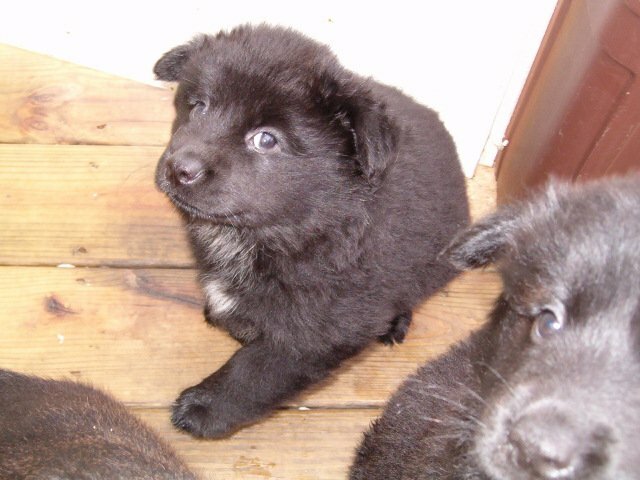 Turns out, her Forever Home was actually here, so ignoring that brief interlude, I’ve raised her from the day she came into this world and seen her grow into a beautiful black husky mix with a low growl that makes her sound like a dog twice her size and infinitely more fierce, though she’s a lover at heart. Soon she’ll no longer shed clumps of black undercoat all over the house during the biannual Husky Shedding. She’ll no longer adorn the recliner, taking it for her own. Soon she’ll no longer whine at the door or at the fence, alert and so unhappy that all those rabbits and squirrels dare taunt her from the outside world. No more trips to K9 Kindercare to run and play with so many other dogs while we travel somewhere for a weekend or a week. No more having to put up with Milo, all twelve pounds of him, jumping and nipping at her in a vain attempt to get her into the right place for “Dinner Time”. No more bounding past everyone to get to her bowl, where she’d woof down her food and then start sniffing at other bowls, just in case. So I made the call after my spate of morning meetings. Work. Work always gets in the way of life. There’s always meetings to be had. I’ll have no meetings on Monday. I’ve already cancelled my afternoon. No work, nothing. And this weekend I’ll do my best to give her the best weekend of her life. Just as I was able to do for Patches… One Last Hurrah before we have to part ways. One last hike together before she has to take that hike alone, across the bridge. This morning I woke up and made a large cup of pour-over coffee. I had a toasted english muffin with apple butter. I had two meetings, and a phone call. And just like that, I scheduled her death. « How do you decide when the choice is not obvious?